Order within 1day 20hrs 20mins for delivery Tuesday 23 April using next day delivery at checkout. Learn It Now is perfect for travel, business, school or personal use. 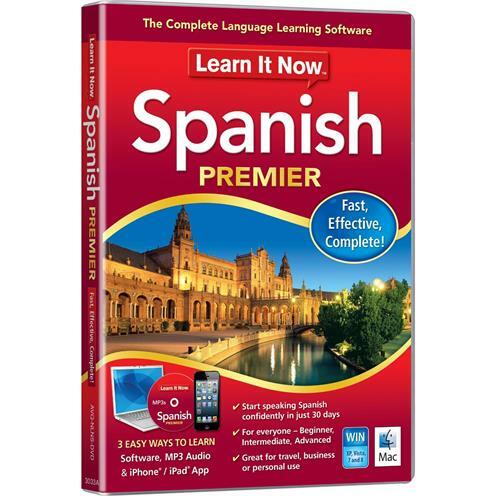 This innovative software is ideal for beginner, intermediate and advanced Spanish speakers. You'll learn and improve your Spanish in an immersive environment so you can speak confidently, and at your own pace. 1. Use the software to immerse yourself in the self-paced learning system. 2. Master your speaking skills on the go with a complete Spanish Audio Course. 3. Practice your vocabulary with audio and pictures using the innovative iPhone and iPad App - test yourself with word lists that match the software. Perfect your Spanish accent! With advanced speech analysis tools, you can record your speech and compare your accent to that of a native speaker. By trying to match the visual voiceprint, you’ll quickly see where you need to change emphasis to ensure your accent and pronunciation is perfect!